Correlations play a BIG role in trading, and in Forex trading especially. As Forex traders, we trade international currencies from different countries from all around the world. Currencies are issued by central banks and are used for international trade, investing and to control economies. The value of a currency has a direct impact on an economy, the outlook for a country, commodities, stock markets and the spending behavior of people. At the same time, currencies are influenced by many different factors such as inflation, interest rates, employment and many more. In this article, I will explain what correlations are, how to use them and which ones to pay attention to in particular. Correlation describes whether two financial instruments (currencies pairs, stocks, commodities, etc) move in the same direction, into opposite directions or have no correlation and relationship. Positive correlation: When two pairs have a positive correlation, they move in the same direction. 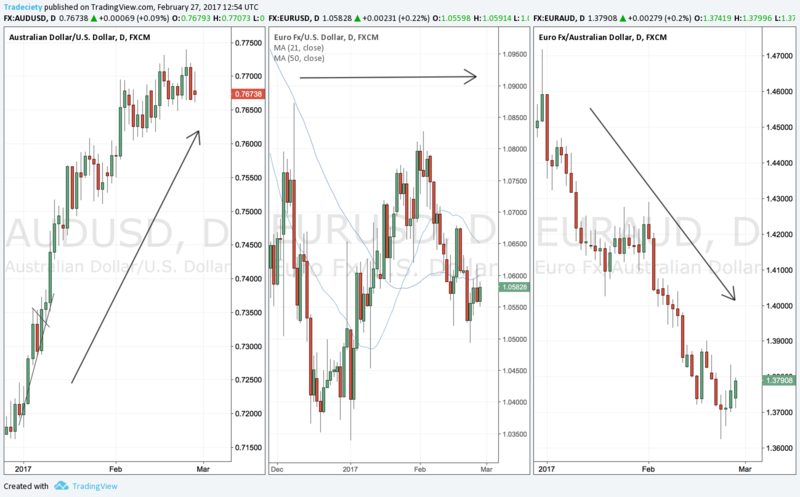 For example, the EUR/USD and the EUR/CAD generally move in the same direction because both have the EUR as the first currency. Also, the USD and CAD often move very similarly. Negative correlation: When two currencies, are negatively correlated, they move in opposite directions. 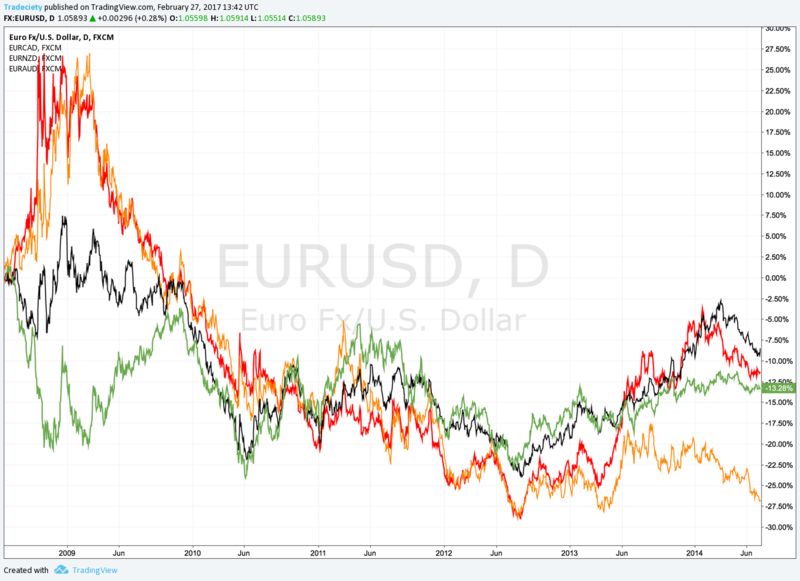 The EUR/USD and the USD/CHF are usually negatively correlated which means that when the EUR/USD goes up, the USD/CHF goes down and vice versa. You can see that the USD is at the second position for the EUR/USD and the first position for the USD/CHF. Don’t worry, you don’t have to calculate it yourself and there are 2 easy ways to find our the correlation of any two pairs or markets. If you are using Tradingview.com for your charting, you can type Correlation Coefficient under indicators and then use their indicator to compare any two markets. One mistake traders make is that they increase their risk by trading multiple pairs without knowing it. For example, if you enter a buy trade on the EUR/USD and the AUD/USD at the same time, you will increase the risk because both Forex pairs are positively correlated. Thus, they tend to move in the same direction very similarly. So if the EUR/USD goes down, there is a good chance that the AUD/USD will do the same and you will realize two losses at the same time. When it comes to Forex correlations, there are a handful you need to know about. Let’s start with the most obvious and common correlation for Forex traders. Forex pairs are almost always correlated and especially if you trade Forex pairs which have one identical currency in it, you need to know about correlations. EUR/USD <> EUR/CAD <> EUR/NZD <> EUR/AUD <> EUR/GBP …. Whenever Forex pairs have the currency at the same place, they are usually positively correlated. The below screenshot shows 4 different EUR Forex pairs and you can see how those often move in sync. You can then use this information for different purposes as we will see shortly. If you trade USD pairs, you need to keep track of the US Dollar Index. The US Dollar Index is a mix of different Forex pairs which include the USD and it shows the value of the USD against different currencies. Knowing what the USD Index does can help traders understand how strong, or weak, the USD really is. If you know that the USD Index is strong at the moment, you can use that to trade high probability breakouts on other USD pairs. Or you can stay out of trades if the USD is weak. Finally, knowing if the USD Index trades into important support and resistance areas can also help you make better trading decisions. 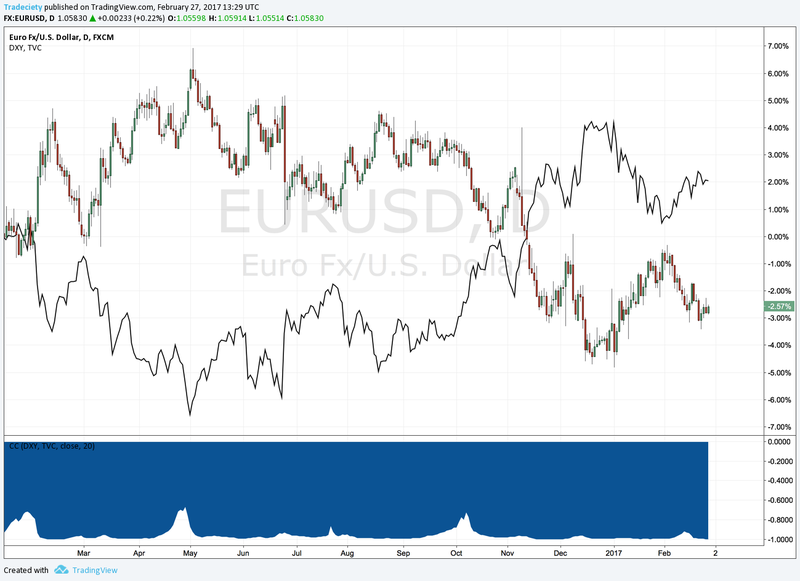 The screenshot below shows the high negative correlation between the EUR/USD and the USD Index; the USD is at the second place for the EUR/USD which is why the correlation is negative. 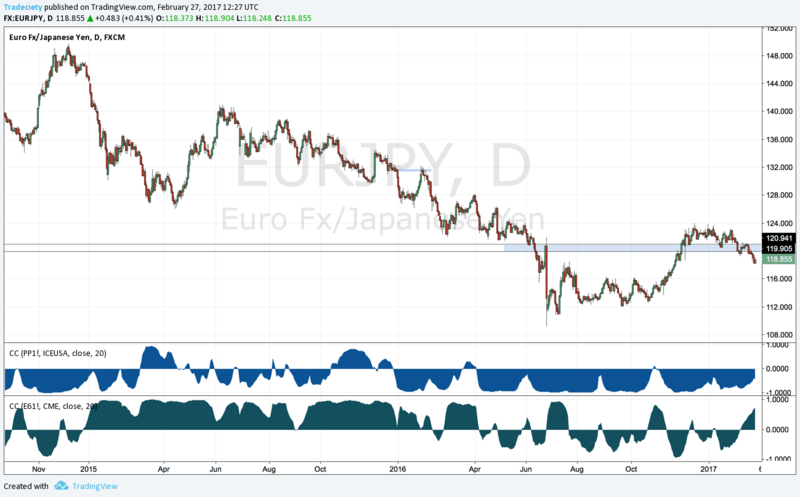 There is no EUR Index or Yen Index that we can follow but there are Euro and Yen futures and aftee we take look at the image below we can see that the EUR/JPY has a negative correlation towards the Yen Futures (because the JPY is at the second place) and usually a positive correlation against the EUR futures. 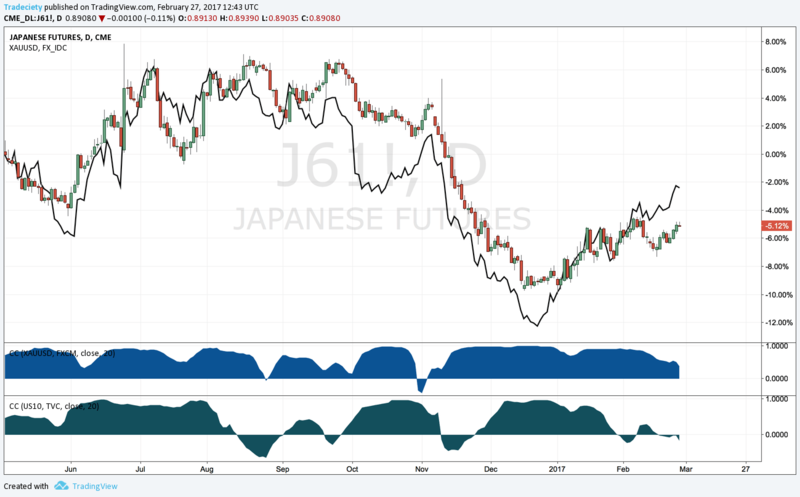 Note that the correlations change over time and it seems as if the EUR and JPY futures drive the EUR/JPY alternately at different times. Thus, it is critical to understand the correlations and which markets to follow for your Forex pairs. There are a handful of, so called, “commodity currencies” and the most popular ones are the Canadian Dollar and the Australian Dollar. Canada is a major oil producer and exporter and the Canadian economy highly depends on oil. 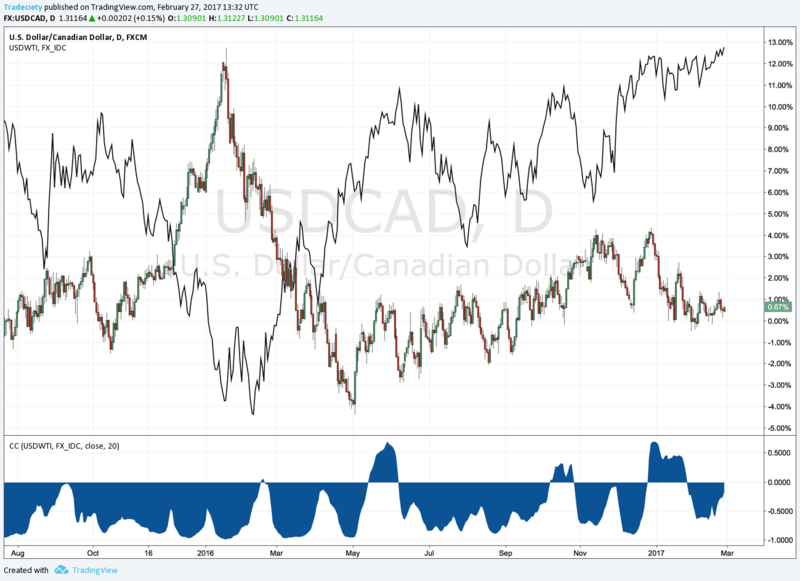 Thus, the Canadian Dollar and the price of oil tend to be positively correlated. If you trade any CAD pairs, it always pays to understand what oil is doing. Australia is a significant gold producer and exporter and the Australien economy depends on Gold and the mining sector. 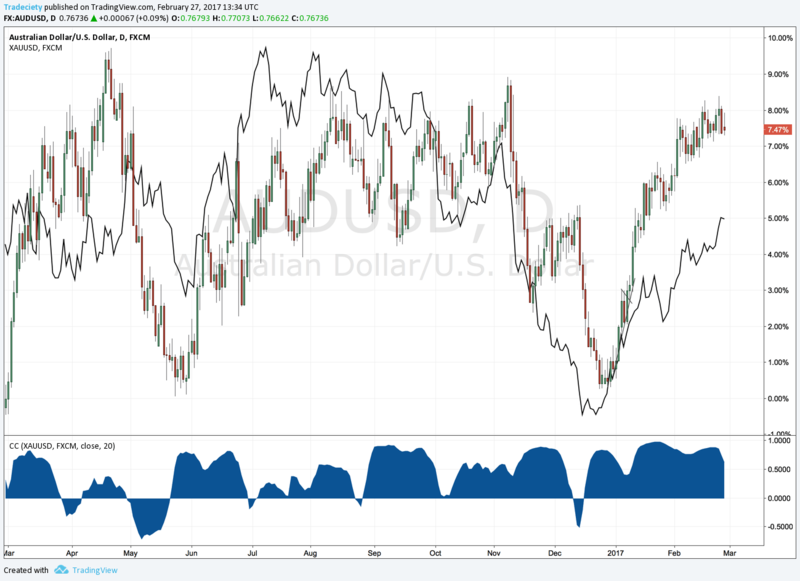 Thus, we can often see that the price of gold and the AUD move together in the same direction. There are two, so called, “safe haven” currencies: the Japanese Yen and the Swiss Franc. In times of uncertainty, investors shift their money from stocks to ‘safer’ investments such as the Yen and the Franc. 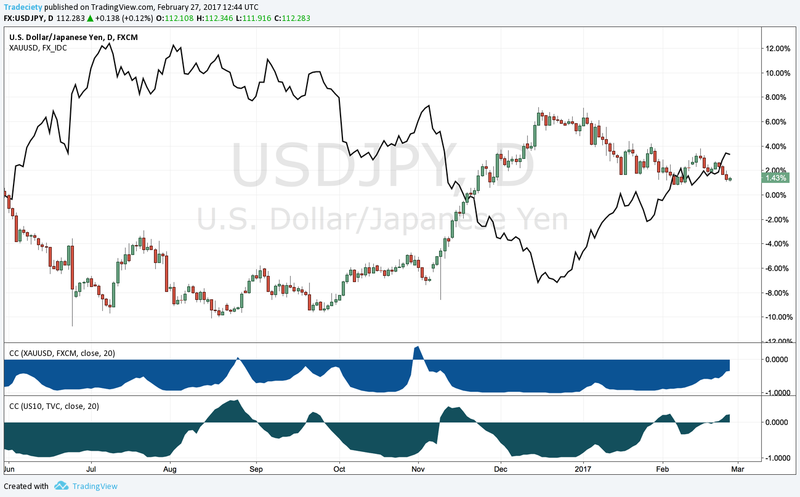 The first image shows the negative correlation between Gold and USD/JPY. When the USD/JPY goes up, investors are selling the Yen and selling gold. In times of uncertainty, the USD/JPY will fall because people buy the Yen and also gold. The second screenshot shows that even clearer. The Yen futures and gold often move in lockstep with very high correlation. The screenshot also shows the correlation to US Treasuries which is also positive. When uncertainty is high, people buy Treasuries and the Yen. Knowing if investors are looking for ‘safe’ investments or riskier alternatives can be very helpful because you can understand which Forex pairs are likely to move the most. Because Forex pairs consist of 2 currencies, we can build, so called, Forex triads. For example, the EUR/USD, AUD/USD and EUR/AUD is a Forex triad. By multiplying the EUR/AUD and AUD/USD price, you can calculate the EUR/USD price without looking at it. This is especially helpful if you want to understand currency strength. By looking at such a Forex triad, you can see which of the three is the strongest and weakest. Also, whenever you have a Forex triad, there are usually 2 Forex pairs moving strongly while one ranges sideways. The screenshot below that in this triad, the EUR/AUD and the AUD/USD trended nicely while the EUR/USD just went sideways. Thus, you can use Forex triads to make better trading decisions and pick Forex pairs in a professional way. Pick the ones that move strongly and stay away from the one that doesn’t – or trade the range on the Forex pair that moves sideways.